We live in a world used to digital images – I think this is harmful for the visual education because we get used to receive a lot of ugliness from TV and the internet. This is visible in return in the new expressions of the visual arts. We forget, for example, who was Bonnard, as a gallerist asked me “who?”, when I tried to detail a little about this painting of mine from 2005, a self-portrait that I made under his influence. 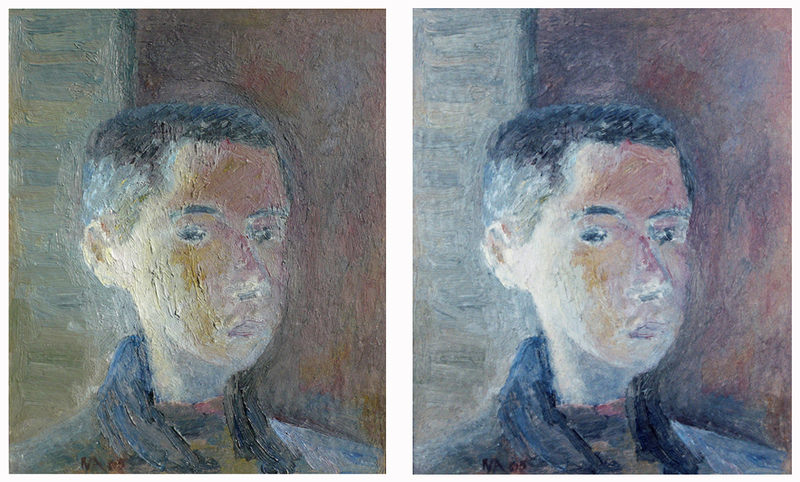 If you click on the image above, you can see better the differences of the two reproductions. That prompted me to remind the importance of the original, which offers much more than one image as its reproduction does, that our culture arrived to diminish. It’s paradoxical that I am talking about an original painting made under some influence – as a thing, a unique object, when the most habitual way to relate the concept of originality with art is to refer to the unique style. This observation enlarges my thought about originality. We don’t need a pattern, a stamp or a shocking new idea to be original, just following our “heart” (mind, soul…). Through the pattern we can be better identified in the exterior, but through the freedom of being “whatever we like” we arrive to identify more and more with our-selves. We also, as human beings, look like other humans – but we don’t have to put strange tattoos on our skin to be recognized. (But we are free to do this.) By the way, the primitives had and have really beautiful models of body painting… this will be the theme for another blog post.